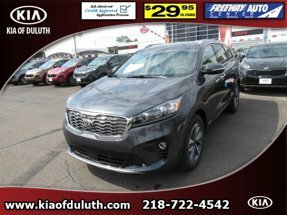 Description This 2019 Kia Sorento LX AWD features a backup camera, blind spot sensors, Bluetooth, braking assist, hill start assist, stability control, traction control, anti-lock brakes, dual airbags, and side air bag system and may just be the car you've been waiting for. This one's a deal at $32,600. With a 5-star crash test rating, this is one of the safest vehicles you can buy. The exterior is a dazzling platinum graphite. Call and schedule your test drive today!